Friday was a terrible day. I wish there was an entertaining way to relay the story of how Asher dropped a huge bottle on the floor and then slipped and fell in the glass, but there’s not. It was horrible and awful and upsetting, I think I’m suffering from post traumatic stress disorder as a result. He’s all stitched and bandaged up and acts like nothing ever happened. I, on the other hand, have felt nauseous ever since and want to cry every time I look at him. Just another example of how children are more resilient than their parents. 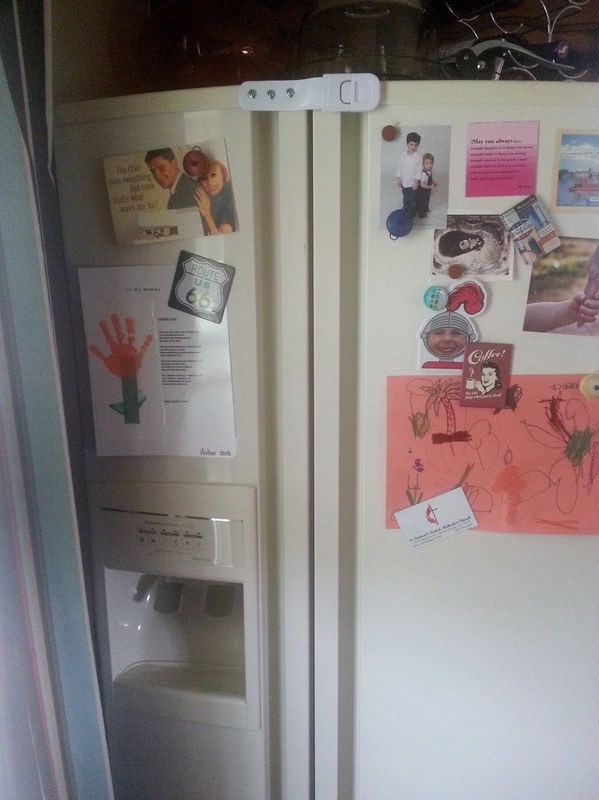 The only entertaining part of this story is what we’ve had to do to keep the kid out of the refrigerator. 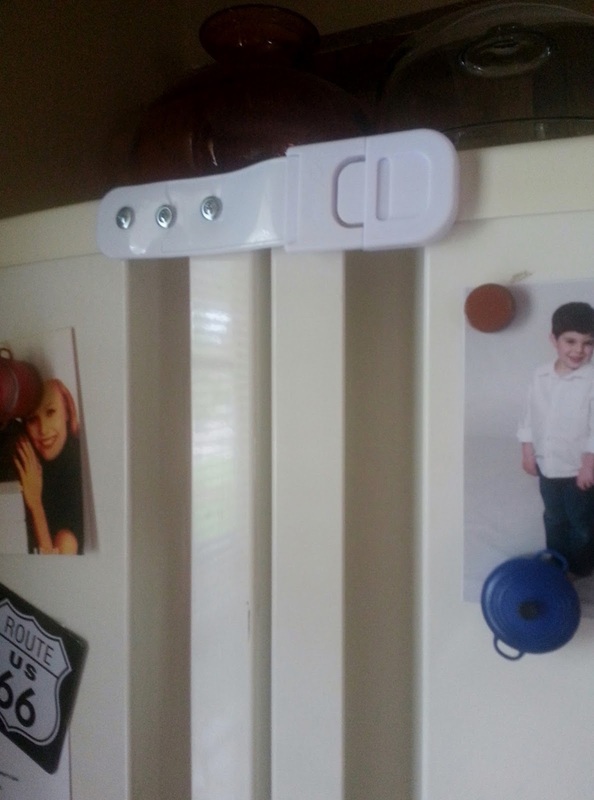 That is a child proof appliance latch that we have screwed in with three metal screws, because the regular adhesive did not do the trick. After the ambulance came and patched him up and Husband left to take him to the E.R., I went in my closet with the intent of changing my blood-stained clothes and had some kind of panic attack. I stood there and thought to myself, “The walls are closing in on me in here, but I know they aren’t REALLY.” And then I left the closet and went to sweep up more bits of glass. I feel like I’m in this place where things are a little out of hand but I don’t really know what to do about it. Maverick has weekly allergy shots. I’m supposed to carry Benadryl and cortizone cream with me at all times. I’m supposed to give him allergy medicine every night and put special cream on his eczema. Asher has stitches and bandages out the wazoo that I have to keep clean and dry. I’ve been emailing his dentist pictures for weeks showing the progress of his mouth injury which happened a few months back. Every day I’ve been cleaning his damaged gums with peroxide. In addition, he’s trying to potty train himself. I DO NOT HAVE TIME FOR THAT. Crazy as it sounds … I don’t think I can handle one. more. thing. Just keep on pooping in your diaper, kid. Pepper developed a terrible skin condition and last week I finally called the pediatrician because she smelled like a wet dog no matter what I did and I knew that wasn’t normal. As it turns it, it’s totally not. She has a milk allergy, is now on hypoallergenic formula, and I have a ridiculous daily regimen for her skin. Brush the cradle cap off her head. Wash her hair with dandruff shampoo. Wash her body with a special soap. Apply prescription lotion. Apply non-prescription lotion. Repeat at bedtime. Later, I was driving on the interstate and completely missed my exit. Like, by a lot. I ended up in the next town. I told my family this weekend that when I have a few moments of silence, when no one is asking me for anything or trying to seriously injure themselves, I totally check out. I honestly feel like I lose time. I go somewhere else, float far away, and only snap out of it when someone says “MOMMY!” I do not remember to carry Benadryl in my purse. I do not remember to apply cortizone when I’m supposed to. I did not bathe Pepper today at all, and there is no way I can change Asher’s bandages without another adult present to help me. I think I’m in over my head but all I can do is keep trying to get above water. One day, I’ll catch my breath. We had some of those latches on large closet type cabinets. They drove me nuts.. it must be much worse to have to have them on a fridge. And all of those things.. all at once..? I would “check out” too. I'm sure you're doing okay. With my own kids, I feel like anything I remember to do is better than if I didn't ever do any of it. I hope your feeling a bit better and can get some practical help. After a good night's sleep, I feel ready to do it again!